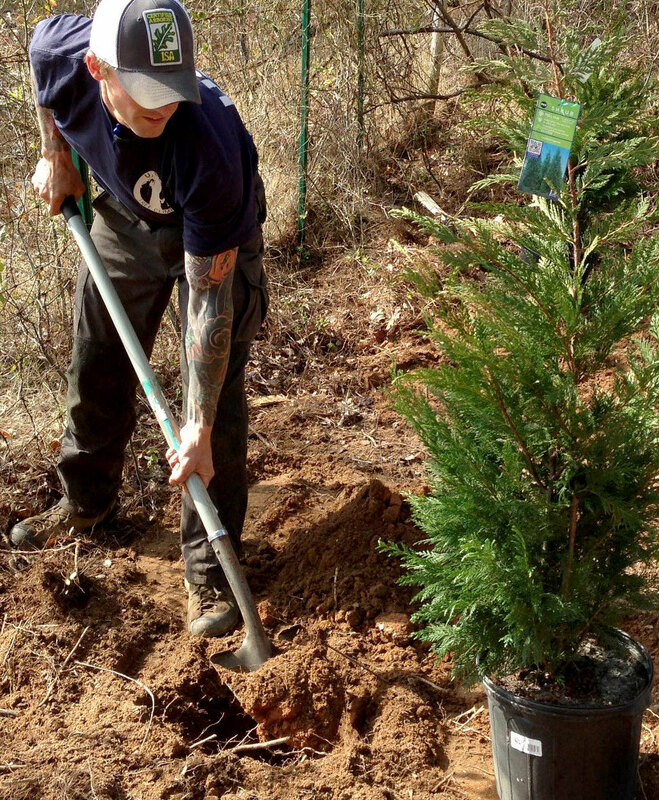 ISA Certified Arborist Joseph Cox plants a tree for future generations. Planting trees is one of the most basic of environmental acts. It embraces the beauty of nature, helps clean the environment from the moment of planting, and sets one’s mind on the well-being of future generations. Early spring and late fall, when the climate is moderate and trees are dormant, tend to be the easiest times to successfully plant trees. Before planting trees, there are a few considerations to get those trees off to a healthy start so you can enjoy their beauty. Athens Arborist takes the time to carefully consider how appropriate a tree is for your site. We look for overhead wires or underground utilities that might be in your way. Available sunlight and soil drainage are also important along with the expected size of the tree and growth rate. Meeting the tree’s growing requirements will help the tree grow strong and will help it to flourish for decades. By choosing a professional arborist to plant your new tree, you can avoid common tree planting mistakes like digging the hole too deep, the wrong soil amendments, or surrounding the tree with too much mulch. Improper tree planting encourages girdling roots that encircle the tree or even disease decreasing its longevity. That’s why we manage everything from planting, to proper staking if needed to advising you on the proper watering required for strong tree establishment. Athens Arborist has the expertise to properly plant your tree for the best of success. A full service tree removal company in Athens, GA. Founded on the principle of preservation and sustainability, ISA Certified arborist and owner Joseph Cox adheres to a strong Code of Ethics while maintaining continued education in the latest scientific and technical knowledge of proper tree care. Day or night, we remove dangerous trees in hazardous conditions. © 2015-2018 Athens Arborist. Professional Tree Service & Care, Tree Removal and Tree Preservation in Athens, GA and the Oconee County areas. By Run Ruffian Web Sites.